Fortinet is the new VPN solution for James Cook University, replacing Global Protect. To install and create a Virtual Private Network (VPN) connection to JCU on a computer running a Windows Operating System follow these steps. 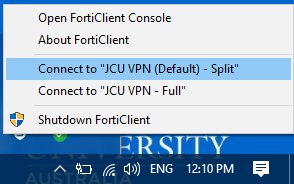 If you are using a JCU owned computer that is currently on-campus then launch the Software Center application and search for FortiClient VPN and Install it. Please contact the IT HelpDesk if you require assistance. If you are on a personal computer, or using a JCU computer from off-campus, then download either the Windows 32 or Windows 64 bit version of the FortiClient VPN, depending on what version of Windows is installed on your PC, and install it. Note: To find your Windows version press the WINDOWS key (Usually found near the Ctrl and Alt key - near space bar) AND the Pause Break key (Usually found near the top right corner of the keyboard). Look at System type for the version of Windows Operating System installed on your computer. If you wish to disconnect from the JCU VPN then locate the icon it in the System Tray and right-click on it and choose Disconnect. Note: The default “JCU VPN – Split” connection gives you access to internal JCU servers and file shares only. To access external web services, journals and other JCU subscription services through the University network (rather than directly through your ISP’s) please use the “JCU VPN – Full” connection.